Condition: Grade: A-, Fine. Linenbacked. A rare rolled poster with no fold lines. Short edge tears and edge creasing restored. 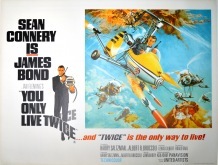 UK release poster for the fifth James Bond film. This poster is desireable not just as a UK Quad format but further because it was rolled and never folded.